RSVP volunteers make lap robes and afghans for veterans at VA Centers, shelters and senior residences. Yarn may be dropped off at our RSVP office in Camp Hill, between 9am and 4pm weekdays. Please call before delivering. A cart is available for transfer from your vehicle. We can arrange to pick up large quantities. In addition to yarn (no rug yarn please), we also need other knitting supplies. Our specific needs include: Red Heart 4-ply acrylic yarn, G and H crochet hooks. RSVP partners with schools, food banks and shelters by collecting and distributing hats, mittens, gloves, socks, scarves and personal care items. If you have other handmade needle-arts items that you would like to donate, we would appreciate your collaboration. Cash donations are also welcomed. If you know of veterans in residence that are in need of any of the items mentioned above, please contact us. RSVP of the Capital Region is a 501[c]3 non-profit community benefit organization that has been assisting volunteers throughout the Susquehanna Valley for more than forty years. 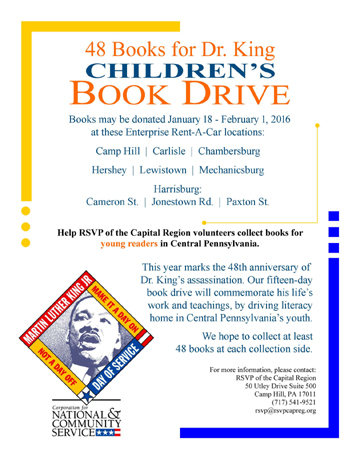 Donate children’s books to benefit Central Pennsylvania’s youth! This year marks the 48th anniversary of Dr. King’s assassination. Our 15-day book drive will commemorate his life’s work and teachings, by driving literacy home in Central Pennsylvania’s youth. Books may be donated Jan 18 – Feb 1, 2016 at the locations shown on the flyer.